Over the past three years I have thought deeply about homework and the meaning behind it. I have come to some conclusions. Each year, I have assigned less than the previous years. The main reason is that I got tired of "policing" it daily. It just gets old. I have found that the ones that don't do it more often than not are the ones who don't have much support at home and probably aren't going to do it regardless. The others that don't seem to do it are the ones who are the incredibly talented ones who already understand the material and it becomes monotonous so they don't see the value of it. So for the majority of my students they do it and get it done. I wouldn't say that I assign homework to just assign homework, but what I do require them to do is finish what we didn't get finished in class. Which for some could be a lot. Others might have finished in class. Everyone works at different paces and I respect that. The other things that I require are typically self-selected projects that take a while to do. Our book projects, which they get to choose their books, are done outside of school, except they can work on them during RTI two days a week if they are not in a RTI group. We also have added the many research papers this year and a lot of the writing has been done outside of school. If I do assign something to be completed at home, it is usually (probably always) something that has already been taught and is just practice work. Yes, practice is good. What I want to see is students engaged with their home life as well. Many play sports and have a lot of practices/games. Many don't have support at home. Many have horrible home lives. Many, especially in my class this year, have parents or elderly family members living with them that are in need of medical attention daily. I have three with someone in their immediate family battling cancer. I've also found that most students "do stuff" after they leave school. Yes, some play video games, but the "real gamers" also interact with other players all over the US and beyond. One of my students has her own YouTube channel that she posts videos to. One is champion barrel racer who completes all over the US. One shows cattle and tends to them daily. One has a dad who leads hunting expeditions for weeks at a time in Canada. I left school today and saw four guys playing hoops together. I have one student who is planning on building and racing a dirt track car soon. One of my student's fathers is preparing to run for a county judge position. She is learning all about marketing and politics. There is real, authentic learning going on outside of the walls of school. I don't want to crush that with some work that just needs to get done to prove that they are doing things. I tend to think of homework as either reflections (I gave all my students blogs this year to write about anything they wanted) or possibly prep for the next day's lesson. I have seen this concept grow over the past year as social media and flipped classrooms have been gaining momentum in the classrooms. I don't like assigning things just to assign things. Grading HW-Like I said earlier, most of the homework is practice or large projects. I'm not going to be grading much of the practice, except to check for understanding. I will be grading the larger projects that are typically on self-selected topics. I think there is a place for homework. It just needs to be done in a way that is beneficial to the student, the teacher, the family, and time. The following is what a committee at my school is working on currently and my thoughts on them. One day late is acceptable if a legitimate reason is given by the student prior to the assignment being turned in. Students need to know the difference between a reason and an excuse. 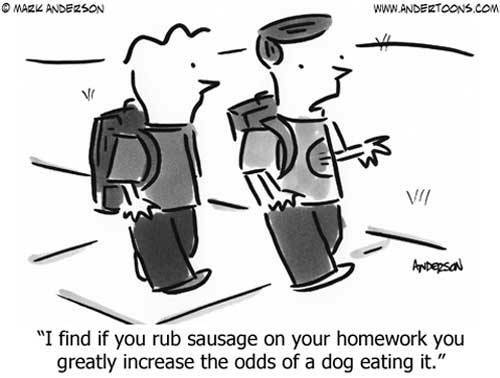 I like the current HW value in 6th grade. 70% Tests to 30% Classwork/HW but it could almost 100% tests since the rest could be practice.